Most Linux distributions are designed for productive work. This isn’t one of them. Hybryde Linux isn’t meant for actual work: instead, it wants to allow the user to see which desktop environment they like best. This is useful, because there are many desktop environments. Hybreyde is intended mostly for testing: developers recommend that you don’t install their distro, ever. Don’t believe me ? Keep reading! This is the sole reason why the ISO for Hybryde is quite large — 1.7GB to be exact. 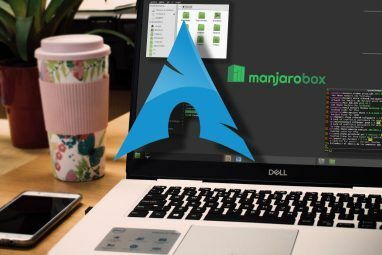 The secret sauce in Hybryde is that you can essentially run all of these desktop environments at the same time, as Hybryde allows you to move applications between desktop environments without having to log out and back in. In other words, it’s the perfect way to test out the majority of the most popular desktop environments on a whim. Once you’re done trying out a desktop environment, you can just click on the return arrow button that you see on the right edge of your screen to go back and pick another desktop environment from the Hy-Menu. Of course, Hybryde also comes with a few features in its own desktop environment, such as a “Magic” button which you can hit at the bottom of the screen to bring up what you see in the screenshot. You can then click the left-mode button to launch and interesting-looking app launcher, or the middle button to bring up some system stats. The right button exists out of this view. It’s this mix of technologies that can cause the system to become sluggish or unstable at times, which is why it is not recommended for actual installation onto a system. Instead, the developers offer the distribution as “conceptual work”. It’s a good idea to take a look at Hybryde (which is based on Ubuntu) to determine the desktop environment you want, but then you should pick a distribution which supports your favorite desktop environment and install that instead. 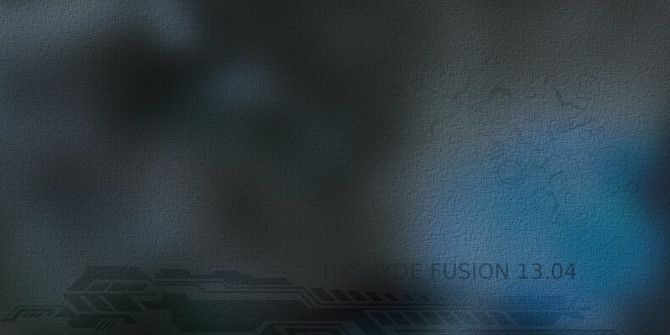 To give Hybryde Fusion a spin you’ll need to download the 32-bit ISO from their website. 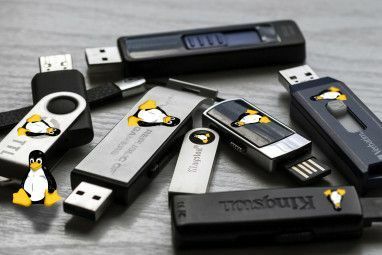 From there, you can either burn it to a DVD or USB flashdrive with UNetBootin How To Install Linux With Ease Using UNetbootin How To Install Linux With Ease Using UNetbootin We've already talked about Linux and why you should try it, but probably the hardest part of getting used to Linux is getting it in the first place. For Windows users, the simplest way is... Read More or with Linux Live USB Creator Linux Live USB Creator: Easily Boot Linux From Your Flash Drive Linux Live USB Creator: Easily Boot Linux From Your Flash Drive Read More and boot off of that media How To Create & Use A USB Ubuntu Linux Boot Jump Drive How To Create & Use A USB Ubuntu Linux Boot Jump Drive Read More , or you could install VirtualBox and run Hybryde through it Download & Test Run Every Linux OS You Want With Virtualboxes Download & Test Run Every Linux OS You Want With Virtualboxes For a long time, I've been curious about Linux operating systems. I've used Windows my whole life, so the idea of switching to another operating system is a pretty big deal. I think switching to... Read More . If you’re looking for a 64-bit version, I’m sorry to say that you’re out of luck. Again, the developers themselves said that Hybryde was conceptual work, so offering a 64-bit version would be rather pointless. I definitely like the idea of Hybryde Linux, as it’s a good way to immediately test out different desktop environments without the struggle of switching ISOs or installing new environments. 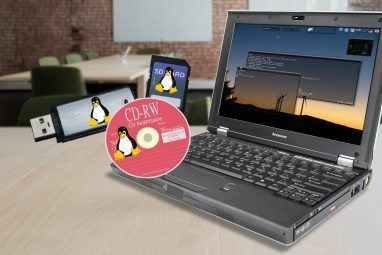 It would certainly help people new to Linux make their choices, as well as have them be aware of all the choices they have. And who knows, maybe even pro Linux users will find out that they enjoy a desktop environment more that they never really paid much attention to. However, I definitely agree that installing it to a system is a bad idea. Be sure to check out other great Linux distributions, once you know which desktop environment you’d like. What do you think of Hybryde Linux? Do you think you would use it for testing out desktop environments? Let us know in the comments! Awesome! Inspiring! Great! So how do you get it? I don't see a link anywhere in here to get this OS. Finally a way to check out multiple DEs while using the same basic install. Surprised no one's mentioned LinuxBBQ which includes "Gangbang" featuring almost all window managers available in Debian installed w/ ability to select at boot and switch anytime after booting. I've never heard of it before. I'll definitely check it out! Nifty. I've been trying to work my way to an Arch Linux installation, and this should help me find my favorite DE. Great article! Interesting tool. Since you are allowed to move applications between environments, One of the things I'd do is test my developed apps between these environments to monitor the differences.